What equipment presents an accesible price, bring in a locker, can be used by all, and improves cardiovascular fitness while toning muscle at the same time? The answer: our 'Challenger' Speed Jump Rope! Improve your coordination, agility and footwork, increase your speed and quickness thanks to this 275cm longer rope. Used since the dawn of time, the jump ropes are an indispensable accessory for any fighter. Ours features specific non slip grip for a great comfort and minimize the tension in your arm. Plus an 1 year guarantee, which ensure its excellent quality-price ration! 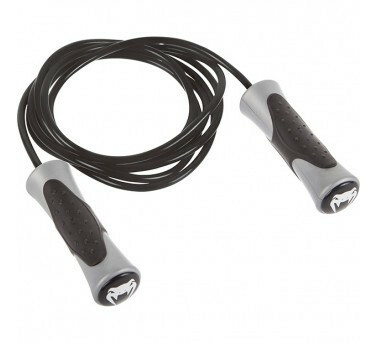 - Speed Jump Rope with an 1 year guarantee. - Material: Vinyl. - Size: 275 cm. - High quality ball bearing for a smooth rope movement. - Non slip grip for a sure, easy and ultra-comfortable grip.